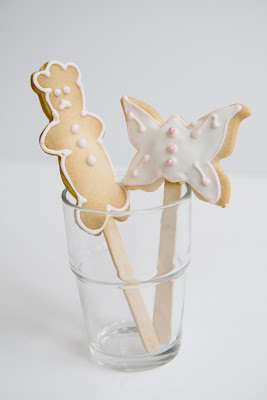 To make it appealing for kiddies, I decided to insert a lolly stick into each sugar cookie. They're easy to make, free of preservatives and artificial coloring and I can control the amount of sugar that goes into the dough. They were a big hit at L's birthday parties. The great thing about it is, both adults and kids love them. Even the husband who hates anything sweet keeps asking me if he can eat "just one more". This is the guy whom I have to force to try a slice of my chocolate cake!!! The recipe is from Nigella's cookbook "Feast" though instead of standard icing, I used Royal icing instead. They're smoother and harden really well which is great if you just want to dump them all into a cookie jar. 2. Cream the butter and sugar together until pale and moving towards moussiness, then beat in the egg and vanilla. In another bowl, combine the flour, baking powder and salt. Add the dry ingredients to the butter and eggs, and mix gently but surely. If you think the finished mixture is too sticky to be rolled out, add more flour, but to so sparingly as too much will make the dough tough. Form into a ball, press down into a fat disc, wrap in clingfilm and rest in the fridge for at least 1 hour. 2. 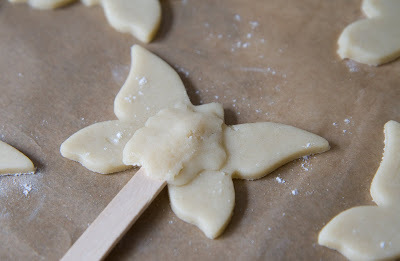 Sprinkle a suitable surface with flour, place the disc of dough on it and sprinkle a little more flour on top of that. Then roll out it out to a thickness of about 1/2 cm. 3. 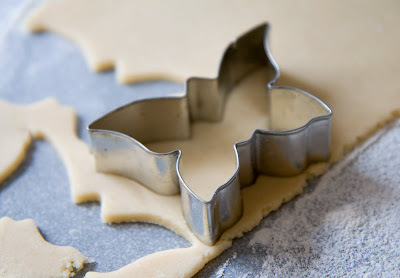 Cut out a shape, place it over greaseproof paper (easier to work with as you'll have to flip the cookie). 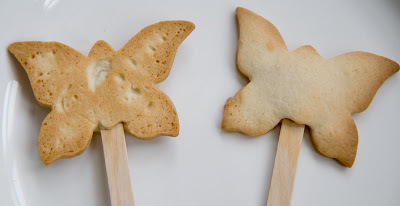 Put a lolly stick down the middle and pinch a small piece of dough and smooth over the stick. Don't worry if it doesn't stick completely as it will flatten in the oven. Lift up the cookie along with the greaseproof paper and flip. 3. Bake for 8-12 mins, obviously it depends on the shape you're using and whether they're on the upper or lower shelf though you can swap them around after about 5 mins. When they're ready, expect them to be tinged a pronounced gold around the edges, they'll be softish still in the middle but will set while they cool. So remove them with a flat, preferably flexible spatula to a wire rack. When they're all fully cooled, you can get on with the icing. 1. Beat the egg whites until they peaked. 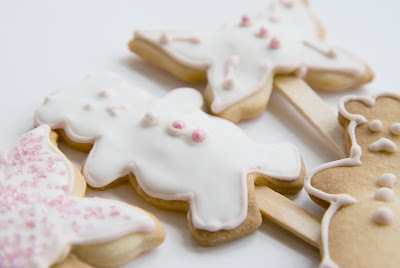 Add icing sugar a little at a time to avoid a mess. 2. 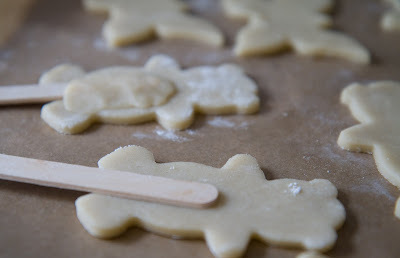 To thicken the paste, add more icing sugar, to thin it out, add water. For piping, you'll require a thicker paste and for flooding, thinner.